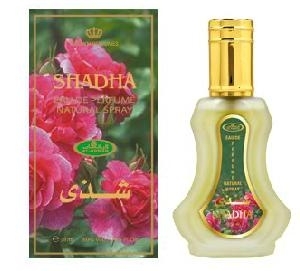 Shadha Al Rehab Genuine Al-Rehab spray perfume from UAE/Saudi Arabia/Yemen. The same beautiful fragrance now available in a spray version. A little of this delightful perfume oil goes a long way. Unique blends make many varities of perfumes suitable for both by men and women. Note that spray perfume contains denatured alcohol. Denatured refers to the removal of the ethanol product’s usage as a beverage/drink and is considered halal to use by Muslims. Usuage of this spray perfume is approved by reliable scholars of Islam. Alcohol Denat, Water, Fragrance, Benzophenone-2. External use only. A dab on wrist, behind each ear and enyoy! Edukan.PK sells genuine world famous Al Rehab perfumes. High quality exotic longer lasting. Comes in 35ml or 50ml Spray. One of the most popular perfume brands in the Middle Est. Inexpensive price does not sacrifice high quality. Matar Al Hub Perfume Al Haramain is a Oriental fragrance for women and men. The fragrance features amber, sandalwood, vanilla, musk, agarwood (oud), ylang-ylang, myrrh and taif rose.